School tragedies are not a modern affliction yet they have been on the rise since the Columbine High School massacre April 20, 1999. 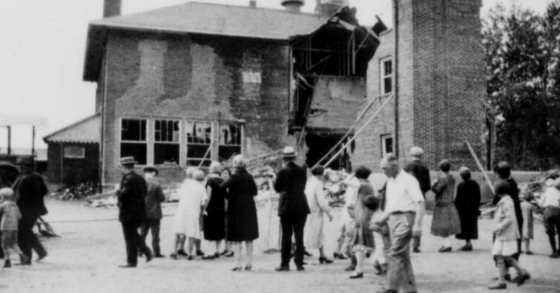 The Sandy Hook shooting in Newtown was absolutely horrifying and a tragedy of unspeakable proportions yet the worst school tragedy in American history was 80 years earlier it took place at an elementary school in Bath Michigan in 1927. An angry citizen, Andrew Kehoe. a local farmer who was trained as an electrical engineer was upset about a school tax and he took his wrath out on his wife first and then dynamited the local elementary school killing 42 people, 36 of whom were kids, while 44 others were seriously injured. and in the year 1926, $19.80. Kehoe was known for his anger, he once shot a dog who was too noisy and shot his own horse for being lazy. He joined the school board to argue against the hated taxes. As the article below show’s he was also seen as a leader in the community viewed as a sage given his superior education (Michigan State University) and extraordinary intelligence. He started developing a “persecutory complex” as he came to conclude that the trivial school tax was ruining him financially. Madmen exist in every era, unfortunately, it’s just that in this age of 24/7 access to news it is reported so much more prevalently. Taxes are a certainty and yet there is no excuse for the actions taken by Kehoe or any other perpetrators of such atrocities.